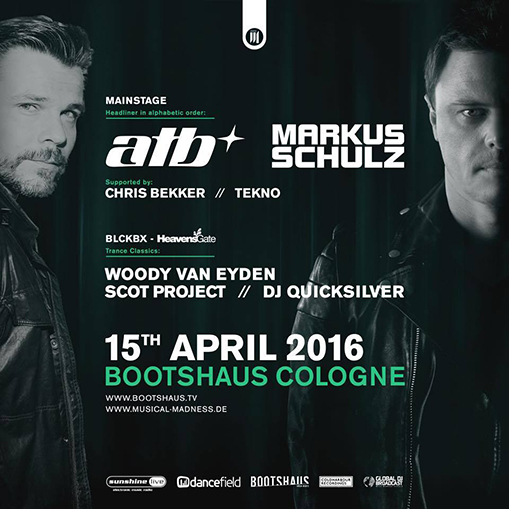 ATB could be engaged in one of his rare club gigs in Germany! In addition to ATB Markus Schulz wants to return to the boathouse after his fat set in May. Supported are the two by Chris Bekker and Tekno. The BLCKBX is all about Trance Classics. Heaven’s head head Woody Van Eyden has invited the Hardtrance legend Scot Project and DJ Quicksilver. To make it as easy as possible within 3 days a replacement lineup under extreme time pressure, since the availabilities of acts are severely limited. We are happy with the result and look forward to a fat trance party with you! As soon as Paul is fit again, his gig wants to be made up and his comeback extensively!